A cruise ship which had some 200 of its passengers knocked about by a gastro bug docked in Brisbane on Thursday, Jan. 4. after a two-week-long holiday cruise. The Sea Princess was hit by the suspected norovirus which affected one-in-10 passengers. The virus first hit two days into the trip, reported news.com.au. Queensland Health officials told the ABC that on-board testing found traces of the norovirus. Norovirus can bring on nausea, vomiting, diarrhea and stomach cramps plus low-grade fever, chills, a headache, muscle aches, and fatigue. Queensland Chief Health Officer Sonya Bennett told the ABC that the virus was mainly severe for the elderly and children. “Ships have been known to have recurrent outbreaks. It’s just a matter of doing as much as you can,” Bennett said. “They don’t ignore it, they do the best they can to control it but it’s very hard to control,” she said. Many of those coming off the vessel on Thursday were unfazed by what occurred. Leon Wallace from the Sunshine Coast told the national broadcaster that he spent New Year’s Eve and New Year’s Day quarantined with the virus. “I guess it’s the nature of it. So many people trapped on board a confined vessel,” Wallace said at the end of the cruise trip which began and ended in Brisbane. He and his wife were undeterred by what occurred and said they would go on a cruise again. Another passenger told ABC that this type of gastro bug spreads easily on a cruise. “Almost every cruise I’ve been on there have been cases of norovirus,” he said. He said Princess Cruises did all they could. “Every night they disinfect everything,” he said. 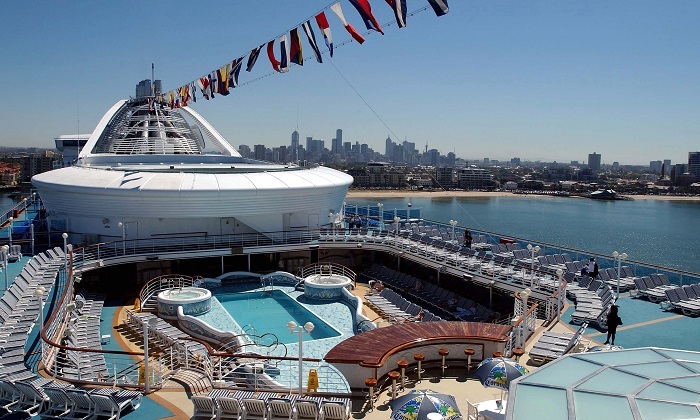 The ship underwent additional disinfection in Brisbane, delaying the next cruise trip. The Sea Princess is the fourth Australian cruise ship to be hit with a gastro illness in the past year, reported news.com.au.